Shimano's Socorro Offshore Spinning Reel is equipped with the high-performing features to keep you covered in all big fish situations. From inshore to offshore, surf to pier, kayak to boat! 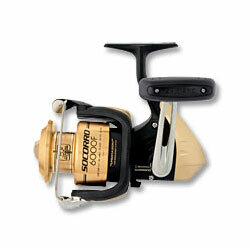 Waterproof drag, Dyna-balance, Super Stopper II, Propulsion line management system, lightweight graphite frame and sideplate and rotor, cold-forged aluminum spool, repairable clicker, Varispeedreg; oscillation, and shielded stainless steel ball bearings.